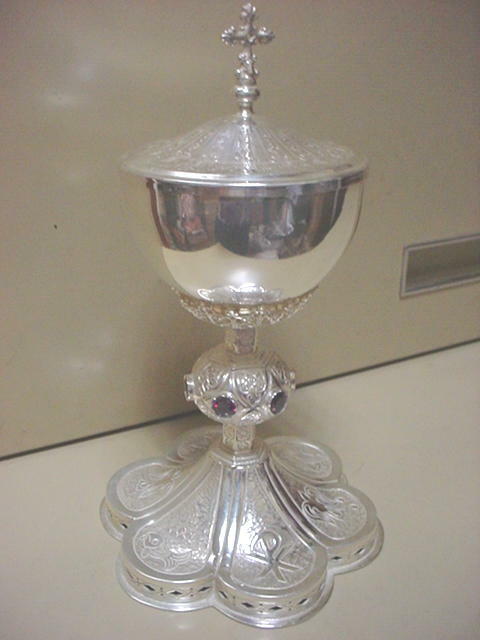 VINTAGE STERLING SILVER CHALICE & PATEN. 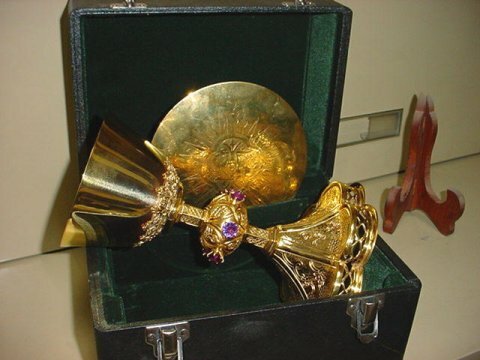 This chalice is about 60 years old. The chalice and paten are ALL sterling silver. 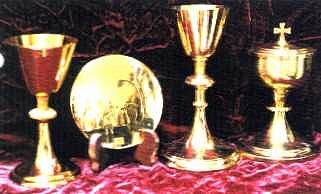 The chalice is 8 1/2" tall, the sterling cup is 4" diameter, the base is 6" diameter. 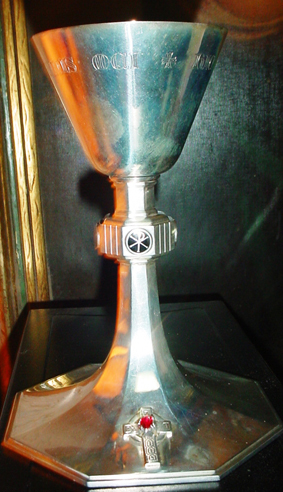 This chalice is very heavy sterling silver. It is not lite or flimsy. Excellent quality. Comes with a wooden carrying case lined in velvet and two flannel pouches. 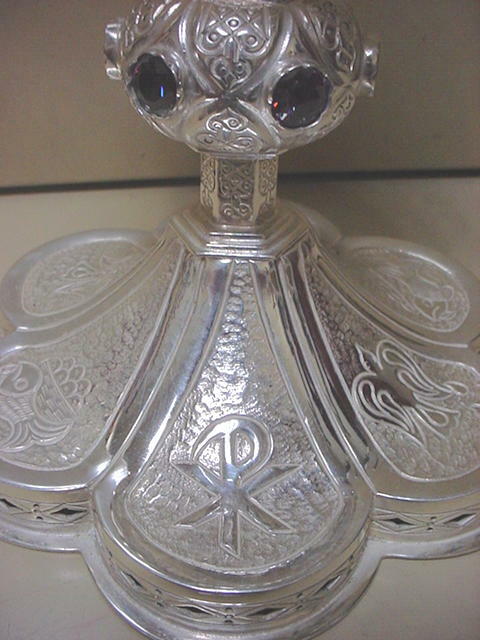 The sterling silver paten is 5 3/4" diameter and has a hand engraved religious symbol symbol in the center. Was unable to make a photo of the paten due to the glare of the flash. We believe this chalice was made in Canada. It has a Celtic cross on the base set with a ruby. 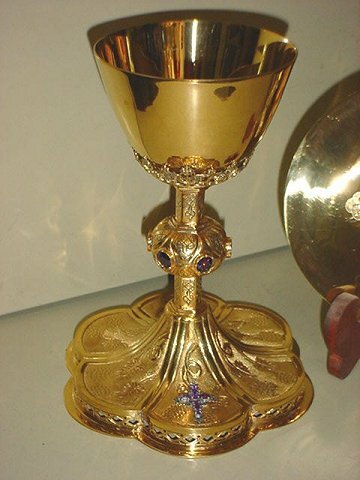 The cup has hand engraved words of consecration in Latin. The node has black enameled religious symbols. It would be nice to have this plain art deco design , but good quality chalice put back into service. Makes a nice gift for a priest who appreciates good quality. What you see is what you get. These are previously owned and fully restored to like new condition. 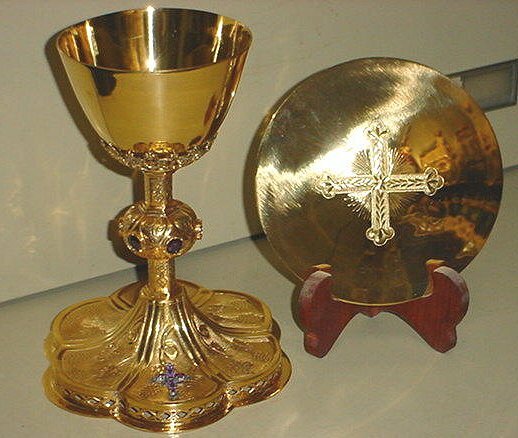 Chalice & paten are gold plated, sterling silver bowl & paten. 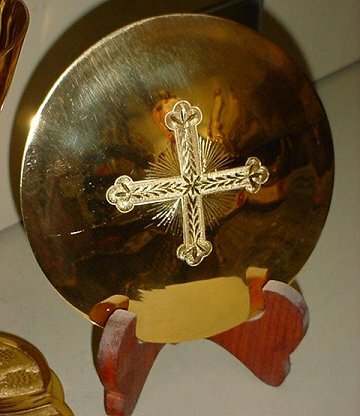 Ciborium is also plated in gold with sterling silver bowl. Some have engraved memorials on base. You may request tall or small size. Specify if you do NOT want one with memorial engraved. Due to popular demand, we are making NEW people's. Communion patens in our little shop. These are made of solid brass, with wooden handle. hand made to last a long time. Previously owned peoples communion paten with nubs. Restored to like new condition. Made of good quality brass. 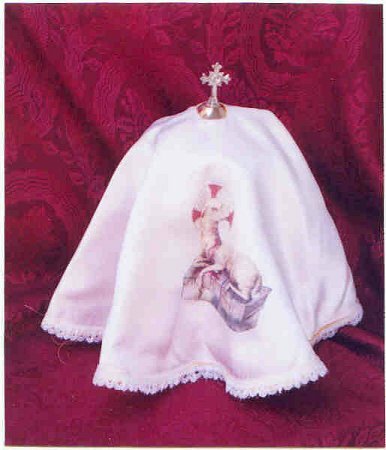 Made of white satin with religious motif. Lined in either yellow or blue satin. 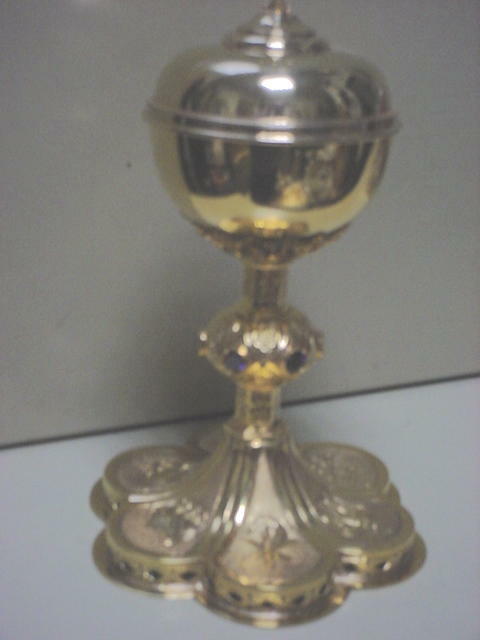 Will fit a standard size ciborium about 16" tall. 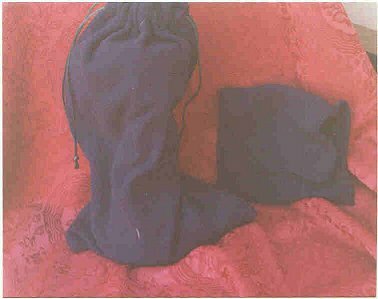 Soft flannel bags for chalice & paten with pull string. Available for small, medium, or large chalice & paten. Also available for ciborium and bishop's mitre. New hand made traditional Gothic design ciborium. All brass construction, silver plated on the outside, gold plated inside the cup. All hand chased designs on the base with faux jewels in the node of purple or red. Stands 11" tall. Superb craftsmanship & quality. All hand made, so sizes may very slightly. Comes with flannel pouches and wood carrying case lined in velvet. 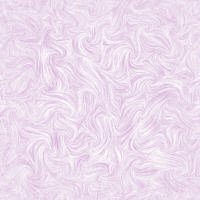 Available with either amethysts, garnets, or alexandrite in the node when available. 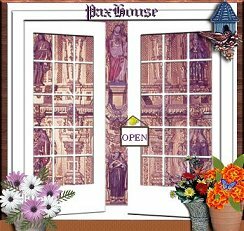 Has a sterling silver cross on the base set with a semi-precious jewel also. Chalice Stands 8 1/2" tall. CLICK HERE for larger view of Chalice. 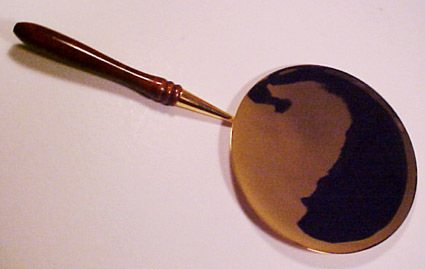 Paten is 5 1/2" in diameter. 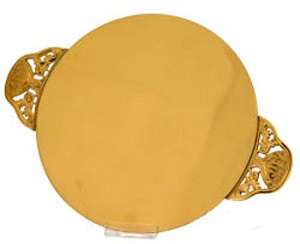 CLICK HERE for larger view of Paten. 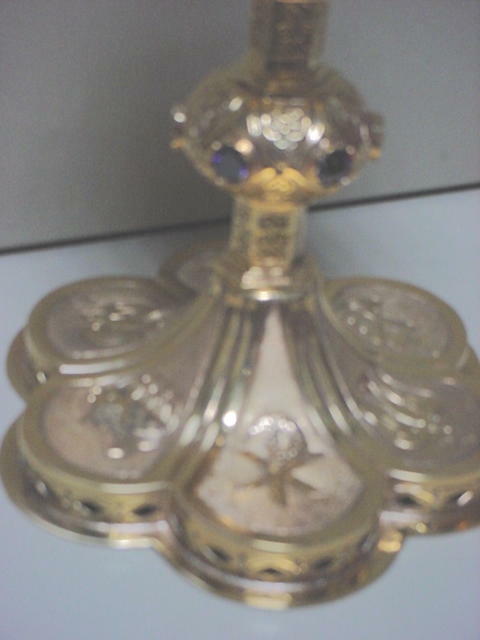 New hand made traditional Gothic design ciborium. All brass construction, gold plated. All hand chased designs on the base with faux jewels in the node of purple or red. Stands 11" tall. Superb craftsmanship & quality. 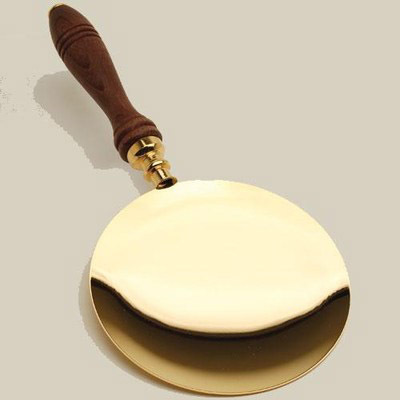 Made of all brass construction, gold plated over all (also in nickle plate, gilt inside). Comes is a GENUINE LEATHER zipper carrying case which looks like a lap top computer case. Religious symbols are embossed on both sides in the leather, one side is IHS, the other side is the Lamb sitting on a book. Has a double leather handle. 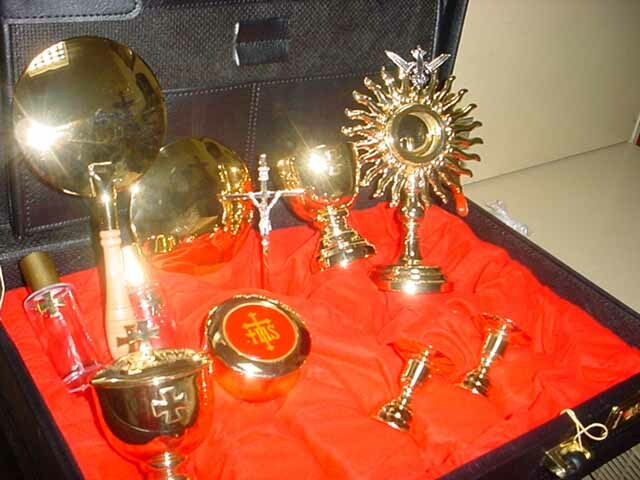 Comes with a chalice 5" tall and paten, a host box for large priest hosts, two dainty candle holders 2 1/4" tall, a pair of glass bottles with metal tops for water & wine: 4" tall; a standing, weighted crucifix 7 1/2" tall, and a ciborium 6" tall. It also has leather pouches inside to hold small mass linens, which are not included. Comes with everything you see in these photos. Nicely made, good quality, not too heavy to carry. Ideal for visiting hospitals for Mass or airport chapels when traveling. Makes a great Christmas gift for the Padre who has everyting and does a lot of traveling. This item is made exclussively by us in our own litle shop. 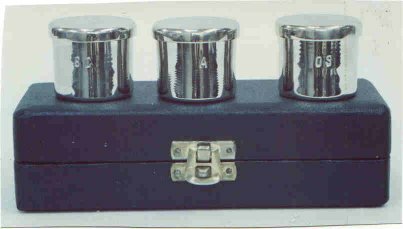 Nickel plated set of three stocks in wooden carrying case. Also available in a slightly different design, LARGE church set for $125. Made in our own little shop by skilled craftsman. We have this swell "Starfleet" attaché case made of genuine imitation leather vinyl , lined in red fabric which measures 13" x 18" x 4". 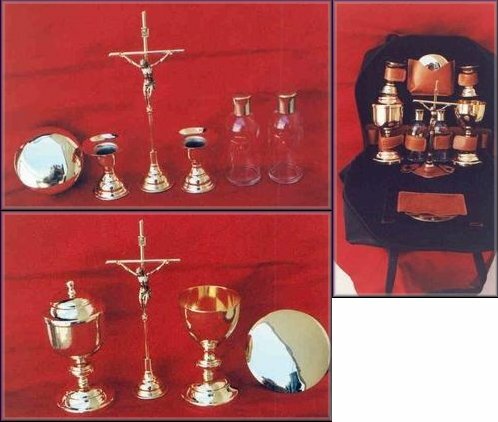 This set comes with a small ciborium 4 1/2" tall, small chalice & paten 4 1/2" tall with paten 4 1/2" diameter; host box for large priest hosts, two glass bottles for water & wine; a peoples paten with wooden handle 4 1/2" diameter; two little candle holders, a small standing crucifix ; and a small monstrance 7" tall which holds a 1 1/2" size peoples host. It can also be used as a reliquary. ALL are made of brass, silver or gold finish. 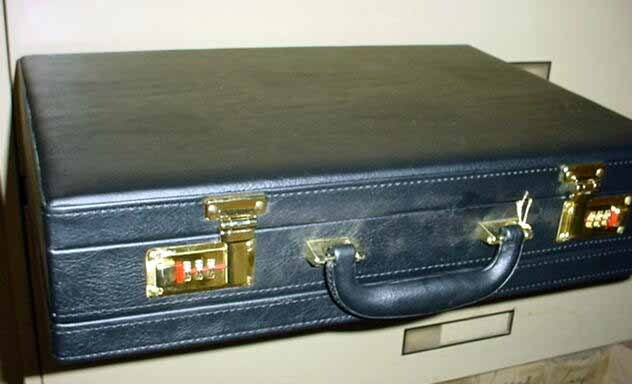 The attaché case has two combination locks, a sturdy molded handle and can expand to hold YOUR light weight vestments. Everything listed is included. NO vestments come with this set. What you see is what you get.